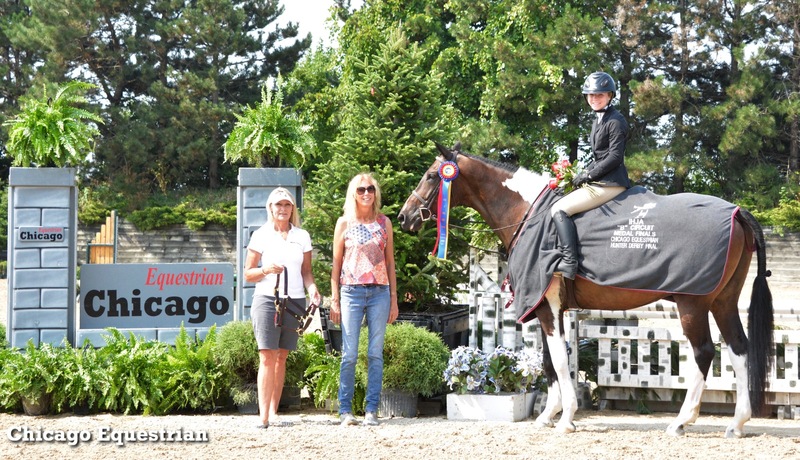 Roscoe, IL – August 26, 2018 – Showplace Productions did not disappoint exhibitors at the annual Illinois Hunter Jumper Association (IHJA) B Finals Show, August 23-26, 2018, with their signature hospitality, beautiful courses and fantastic awards at Ledges Sporting Horses in Roscoe, Illinois. Show manager Pat Boyle and his staff take pride in their productions from the local level up to the FEI events with attention to the details for an unforgettable experience. Boyle turned Sunday into a grand finale, opening up the huge grand prix ring for the ChicagoEquestrian.com Hunter Derby Finals and the IHJA B Medal Finals. Add in the complimentary lunch and great awards to make a memorable finals show for the up and coming local riders. Aerin Hopkins and Batchelor Party with trainer Sue Kavalik accepted the award for the win in the ChicagoEquestrian.com Hunter Derby Finals from Chicago Equestrian's Brenda Mueller. 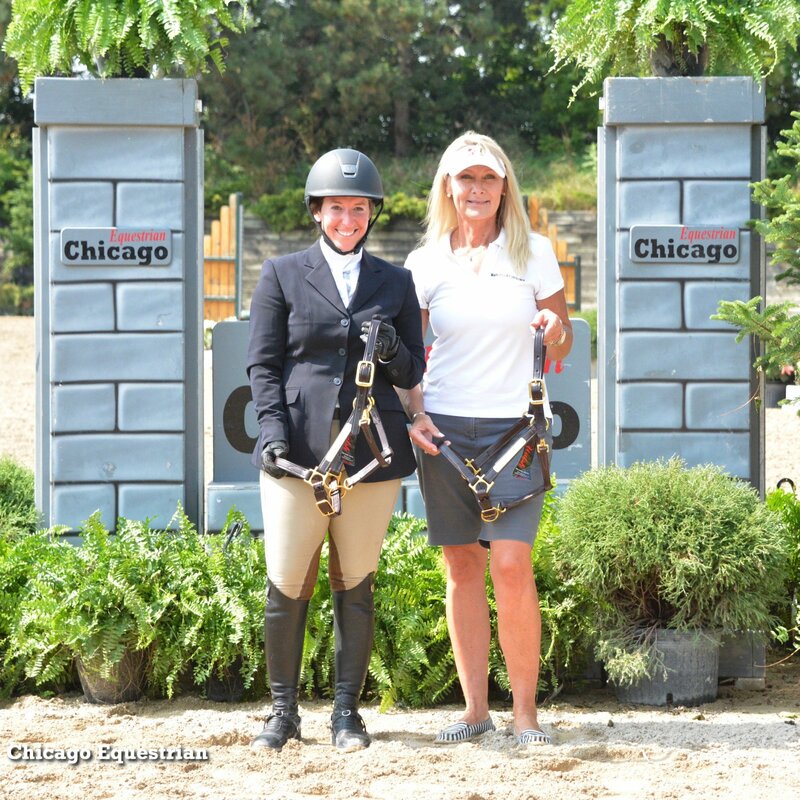 Kicking off the day with the win in the ChicagoEquestrian.com Hunter Derby Finals was Aerin Hopkins with Hannah Batchelor's Batchelor Party. Hopkins earned scores of 83 and 84 in the two round competition to tip the scales in her favor out of 31 entries. "[This derby] is a great place for riders to start in the derbies," said Hopkins' trainer Sue Kavalik of Oswego. "The medal finals gives them a chance to ride in the big ring and test their skills at their level." Leading Professional Rider in the Derby Series was Carmine D'Aversa. 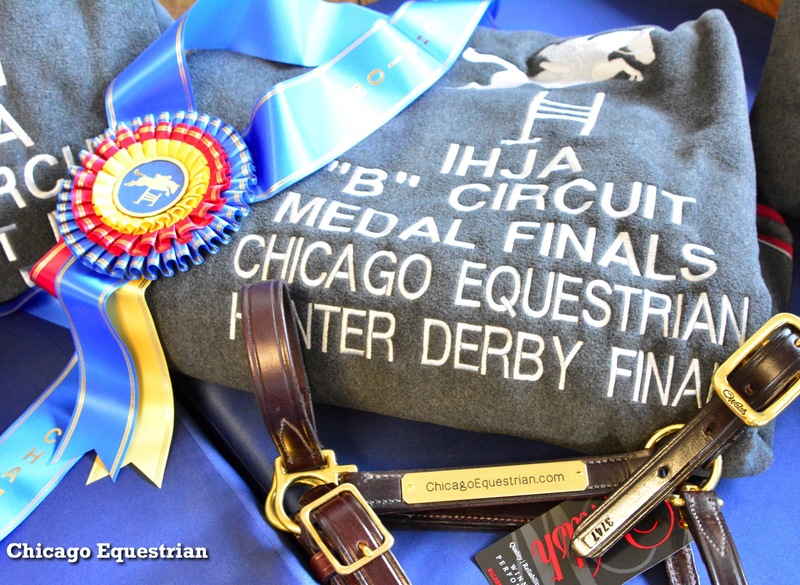 Series awards for he ChicagoEquestrian.com Hunter Derby Series were given out after the class, which is available at all Showplace Productions' B shows throughout the show season. Earning the Leading Horse award and a gorgeous Walsh Halter, was Perfecta Farm's Cassandra, ridden by trainer Carmine D'Aversa, who also clinched the Leading Professional Rider award for the series. 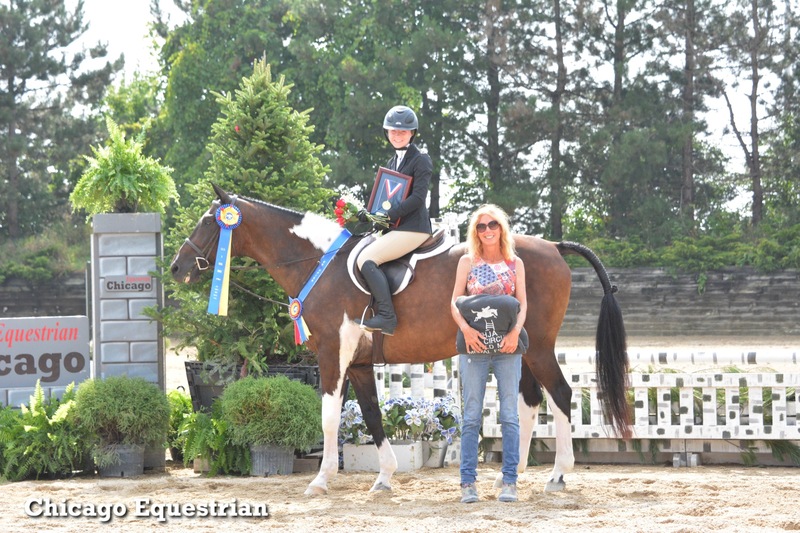 "I like that the kids get the chance to do the derby and the medal and get out in the big ring because they don't get to do that anywhere else," said D'Aversa about the IHJA B Finals show. 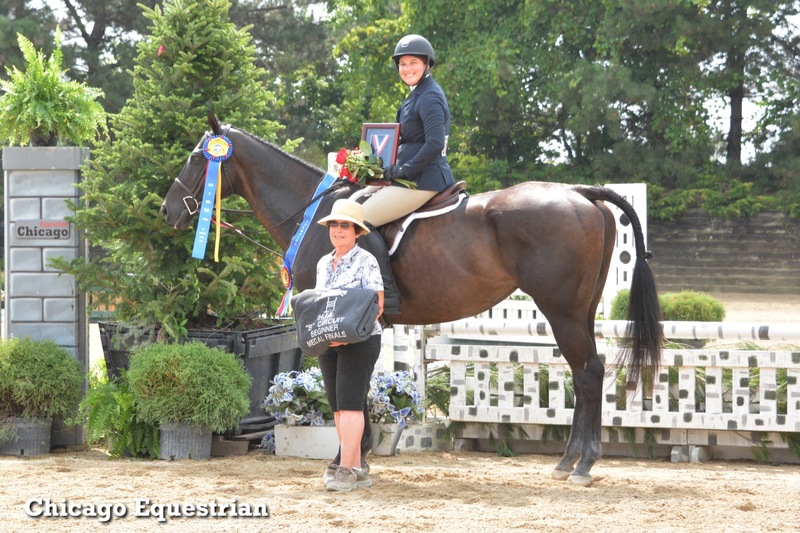 Denim Welhouse earned the Leading Junior Rider Award. Denim Welhouse of Paynette, Wisconsin, earned the Leading Junior Rider award for the series. Welhouse rode several different mounts throughout the season including the three-year-old quarter horse, Miss American Pie, she rode in the finals. Reagan Biemolt won the Limit Medal Final on Bombardier. 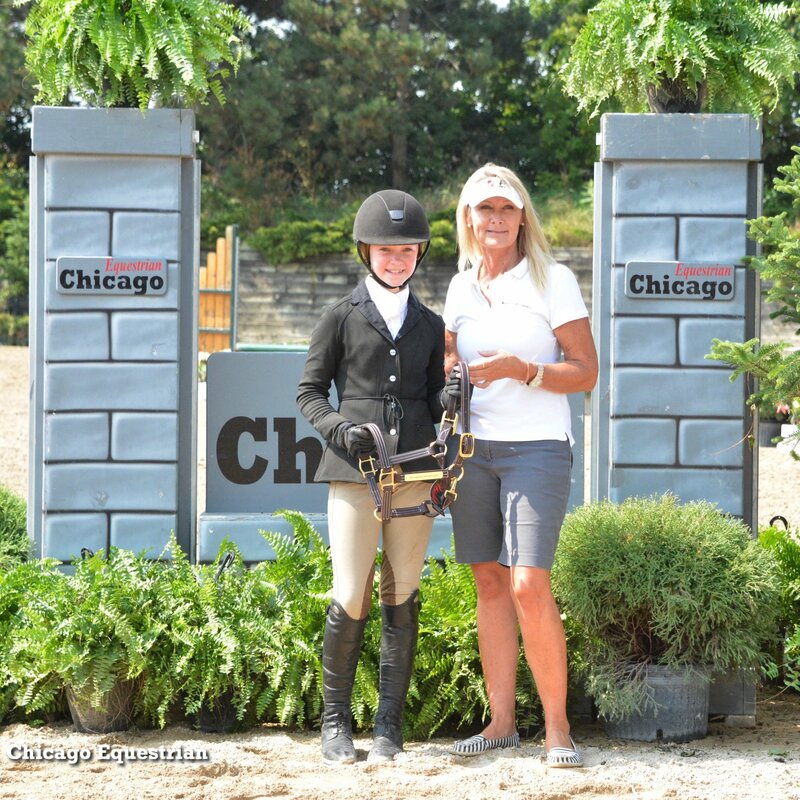 The day moved on to the IHJA B Medal Finals, starting with the Limit Medal. Riders demonstrated their skills over the challenging course followed by a work off to earn the top prize. It was Reagan Biemolt who held the top spot through the work off for the win. She rides with Perfecta Farm and trainer Carmine D'Aversa. Trainer Diane McClure commented on the B Finals show, "I love all the presentations, the ribbons, the trophies the flowers, it really makes it feel special. 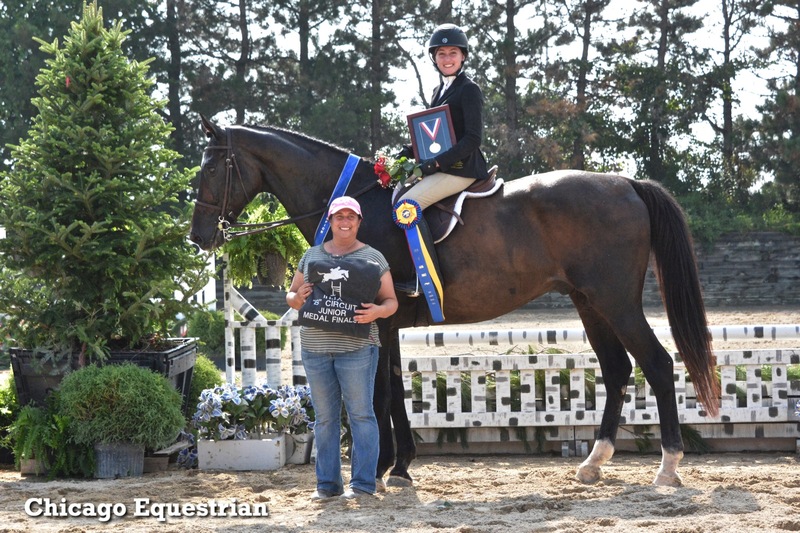 The kids that maybe don't make it to the victory gallop or the kids that are watching can aspire to do it next year - they want the fancy ribbons and the victory gallop, so I think Pat makes it a really special event." Isabella Baddick with trainer Michele Muenzenmay in the winner's circle for the Beginner Medal Final win. Isabella Baddick earned her first gold medal in the Beginner Medal Final aboard Russell. Baddick trains with Michele Muenzenmay and was called into the work-off in third place but moved up to take the lead. "Everyone is so nice and so supportive here at the show," said Baddick. "This was my first medal win. I've put a lot of work into it so I'm glad it all paid off." 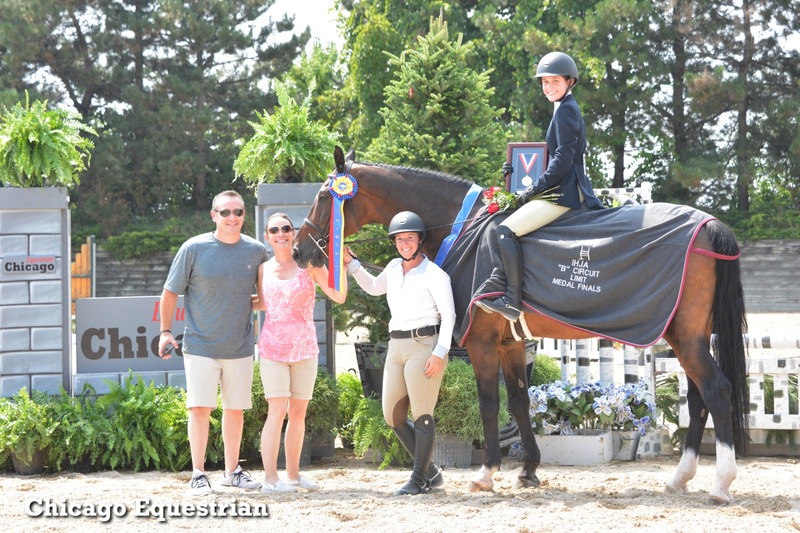 Aerin Hopkins won the Children's Adult Medal Final in addition to her earlier derby win. In the Children's Adult Medal Final, Aerin Hopkins once again topped the list with Batchelor Party. The pair was called in on top and held that spot through the work off to earn the gold medal. Sydney Savage and Where's Waldo earned the top call in the Junior Medal Final. The final victory gallop of the day was for the competitive Junior Medal Final. Sydney Savage, who rides with Jamie Gerardi, was called in for the work off in third place but managed to impress the judges to move into the top spot for the win on Where's Waldo. 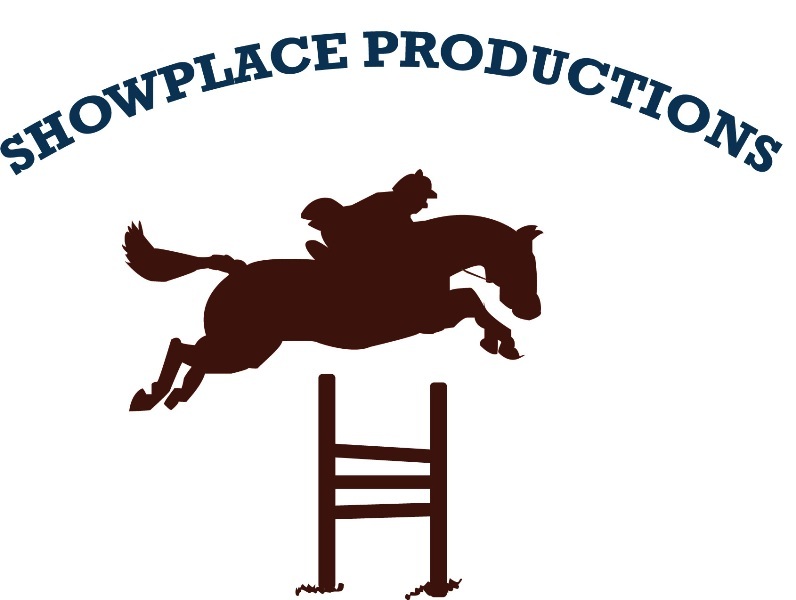 Showplace Productions continues the winning tradition with the Showplace Fall Classic Series featuring the IHJA A Medal Finals, the NCEA Midwest Medal Finals, the Midwest Marshall & Sterling Championships and the Zone V Finals at Hits Balmoral Park, September 12-16, 2018. Come to show or cheer on your barn at this exciting championship! For full results and a schedule of other Showplace Productions events, visit www.showplaceproductions.com. Photos to be used in relation to this release or with permission only.